When you apply a formatting theme to projects created in Office 2011 for Mac, you can achieve consistent colors and fonts for the elements included within your Word documents, Excel spreadsheets, and PowerPoint presentations. 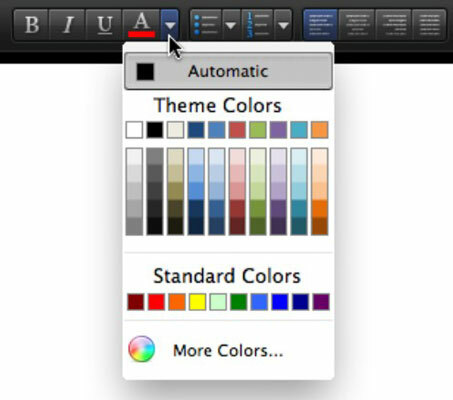 You can choose from Office for Mac’s built-in themes or make your own. A font family that comprises two fonts. In Word and Excel, click the Ribbon’s Home tab. In the Themes group, click the Themes button. When you click the Themes button, the themes gallery displays. Choose a theme. All elements in the document or workbook that respond to theme colors and fonts will be affected. Before choosing a theme, select specific slides in Slide Sorter View or in the Slide Preview Pane. Reminder: Hold Command to select more than one slide at a time. A pop-up menu lets you choose to apply the theme to the selected slides or the entire presentation. Alternatively, you can choose Browse Themes within the Themes gallery and navigate in the resulting dialog to a saved theme file. Choosing a saved theme applies the theme. Themes are not supported in Compatibility Mode. When working on files that were saved in 2004 or earlier format, themes options are grayed out. Save the file in a current format to enable themes. When you directly apply a color format in Word, Excel, or PowerPoint, you see the familiar color palette. The colors in the Theme Colors row of the color palette change to match the colors of the theme you applied. The color variations beneath the theme colors row provide shades (darker variations) and tints (lighter variations) of the theme colors. Each column has these shades and tints of the theme color at its top. The color palette does let you wander away from the theme colors by choosing the More Colors or Standard Colors options, but if you choose to do so, you defeat the purpose of using themes.